Some of the best restaurants in Italy are tucked away between buildings, nestled in dimly lit alleyways, and kept under wraps by the local community. And as you discover La Soffitta (located where the longstanding Le Grenier restaurant used to be), you’ll realize that Italia has finally arrived in Vineyard Haven. 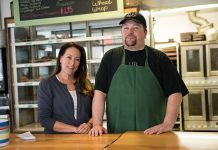 Just One Bite Restaurant Group, local restaurateurs and owners of Waterside Market, Blue Canoe, and Parkside Market (in Falmouth), are now offering Italian cuisine with the latest restaurant addition to their group, La Soffitta. Executive Chef Anthony Carroll worked for the restaurant group previously at Parkside and Waterside Market, where he acclimated himself to the Vineyard. But getting a feel for the Vineyard wasn’t the only thing he needed to do — he immersed himself in the study of Italian cookery once the concept was confirmed. Italian food became Chef Carroll’s passion shortly after speaking to Susan and Stephen Bowen (of Just One Bite Restaurant Group, where he he is now the third owner), and they brainstormed the essence of what La Soffitta would be. 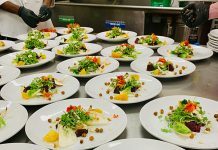 For two intense weeks, Chef Carroll honed his skills at the Italian Culinary Institute in Calabria, Italy, where he studied under Master Chef John Nocita. Chef Nocita, a worldwide culinary competitor and judge, started the institute to share not only the food of Italy, but the culture and language, and its love of food. “The experience and the camaraderie that we all felt while there was amazing. I was only there for two weeks; the rest of my classmates were there for three months. I unfortunately had to get back to work, but it was an incredible experience, and I just hope that what we do at La Soffitta lives up to what he has taught me, an experience I will never forget,” says Chef Carroll. you walk up the stairs plastered in a vintage, romantic wallpaper of notable Italian influencers such as Fred Astaire and Picasso, you start getting the vibe for the place. Turn left at the top of the stairs, and you’ll approach a gorgeous bar that showcases some of the best wine selections in town. The lounge area, along with the shuffleboard, creates a great ambiance for either families looking for a fun night out or a romantic dinner for two. The menu is divided into appetizers, entrées, and shared entrées, something for everyone at the table. Start with the calamari fritte served with a trio of sauces (housemade red sauce, spicy red sauce, and lemon aioli). Unlike any other calamari on-Island, this one is breaded in Italian ciabatta breadcrumbs, creating a light and crispy texture. Other great appetizers include the portabella caprese, a gorgeous salumi and formaggio (cheese) board, and the smoked P.E.I. mussels. One of the most impressive yet simple dishes available at La Soffitta is the housemade pappardelle pasta in a lusciously creamy lobster sauce. Thick-cut pappardelle swim in an incredibly rich and decadent cream sauce, speckled with sweet, fresh lobster meat that has been perfectly cooked. 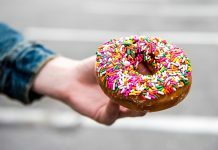 If calories didn’t count, it could be eaten every day. 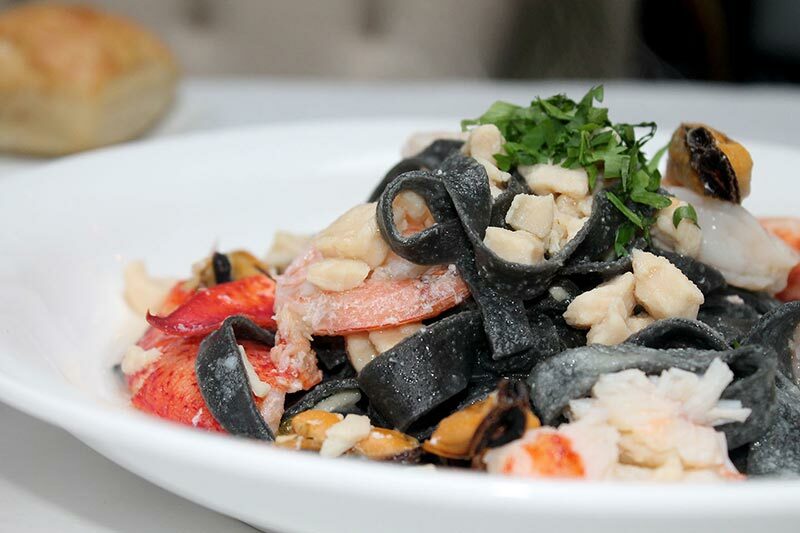 Another popular dish is their squid ink pasta — handmade pasta with a seafood ragu that includes mussels, shrimp, and lobster. It’s a seafood lover’s dream, and Chef Carroll has clearly mastered the skill and patience this fickle dish requires. For those with special diets, most pastas can be made gluten-free per the guests’ requests, and the the restaurant can also cater to other diets such as dairy-free, vegetarian, and vegan. If you’re looking to dine with a group, order the handmade noodle lasagna: “It melts in your mouth,” says Chef Carroll. And make sure not to skip dessert; their tiramisu is an Italian classic, as well as their take on an Italian wedding cake, which is served with two kinds of gelato; the mascarpone chocolate espresso gelato is especially heavenly. It’s the ideal spot for satisfying your classic Italian food cravings in a comfortable setting. La Soffitta is definitely a place to discover this season. La Soffitta, 82 Main Street, Vineyard Haven, 508-687-9448. Visit their website for a full menu and wine list at lasoffitta.com.